Turkey’s government has told its citizens traveling to, and living in, the United States to stay away from mass protests in US cities as anti-President-elect Trump demonstrations stretch into their fourth day. “Within the context of risks caused by the incidents and of social tension, our citizens who live in the US, or who are considering travelling there, should be cautious,” said Turkey’s Ministry of Foreign Affairs on Saturday. The travel advisory warns Turks of the violence seen during the protests and of rising racist incidents taking place throughout the country. “Sometimes the protests turn violent and criminal while protesters [are] detained by security forces,” said Turkey’s travel advisory. The ministry formally advised its citizens to “follow local media, to follow the warning of our embassy in Washington and American security forces, to stay away from protests, to increase their security in work space and to apply to local security when there is a racist or xenophobic attack while keeping calm”. Prompted by President-elect Trump’s campaign rhetoric including his call to build a wall along the US-Mexico border and ban Muslims from entering the country, thousands of Americans have taken to the streets since November 9, to protest against his shock 2016 presidential election victory. Cities including New York, Los Angeles and Chicago have been the stage of daily demonstrations. A man was shot in Portland during an anti-Trump demonstration. 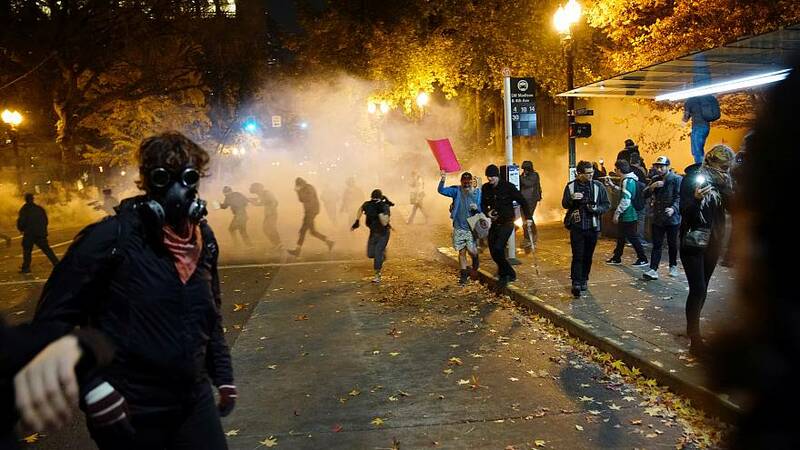 The Foreign Ministry’s statement, reported Turkey’s Daily Hurriyet newspaper, deliberately mentioned the protests taking place in Portland, and warned similar incidents could continue throughout the country. “It has been understood from protesters’ social media accounts that the protests will continue for a while,” the warning said. The United States has had a travel advisory on Turkey since October 24, citing instability in the country’s Kurdish southeast and mounting threats made against US citizens, interests and US Embassy staff. Racist and hate crime attacks have been on the rise since President-elect Trump’s victory. More than 200 racist incidents involving intimidation and harassment have been documented as of November 11, says the SPLC. The majority of incidents target blacks but attacks have also been reported against immigrants, Muslims and LGBT groups. Some even target Trump supporters themselves. In an interview with CBS on Sunday, during which President-elect Trump was challenged on whether he was aware of racial incidents done in his name and during which he was given a moment to speak to his supporters directly, Trump urged non-violence. Trump has vowed he will be a president for all Americans following his election victory, saying he will help the nation come together. But on November 10 Trump took to twitter to voice his displeasure at “professional” protesters unhappy with this election victory. Only to backtrack a few hours later.